Facebook has had a chastening couple of weeks, and it now seems likely to be overtaken by YouTube as the second-biggest website in the US. The market-research firm SimilarWeb said Facebook’s monthly visits had fallen from 8.5 billion two years ago to 4.7 billion in July, while YouTube has been quietly edging up. Facebook’s losses must be seen in context, however, as its portfolio is growing on the back of its app and other platforms, like Instagram. The biggest share-price nosedive in Wall Street history, a shareholder revolt, another round of election meddling, and the barring of a notorious conspiracy theorist only after a rival had acted. It’s been a cataclysmic couple of weeks for Facebook. And, according to a study by SimilarWeb, the news is not about to get any better. In a blog post published Wednesday, the market-research firm said it thought Facebook was about to lose its place as the second-biggest website in America to YouTube. In what SimilarWeb’s Stephen Kraus described as a “paradigm shift,” he said his projections suggested “YouTube’s traffic will pull ahead of Facebook” as the runner-up to Google in the next two to three months. Facebook’s monthly visits fell from 8.5 billion two years ago to 4.7 billion in July, SimilarWeb found, while YouTube has been quietly edging up, hitting 4.5 billion visits last month. You can see the trend in SimilarWeb’s chart below. There were signs of flattening in Facebook’s second-quarter earnings in July, when it revealed that overall monthly active users in the US and Canada were flat at 241 million. It also lost a million users in Europe, where it had 376 million monthly active users in the three months that ended at the end of June. But SimilarWeb said Facebook’s losses over the past two years must be seen in context. While the main website may be shedding traffic, Facebook’s network, including Instagram, WhatsApp, and Messenger, is actually growing. Use of the Facebook mobile app is also increasing. “This transition reflects how Facebook is focused, not just on growth for their main site, but rather on expanding their entire ecosystem,” SimilarWeb said. As Facebook noted in its earnings, 2.5 billion people – a third of the world’s population – now use at least one of its products each month. YouTube has established itself as the “primary entertainment/information source for the younger generation” and benefited from a “growing openness among consumers” to video, SimilarWeb said in the blog post. 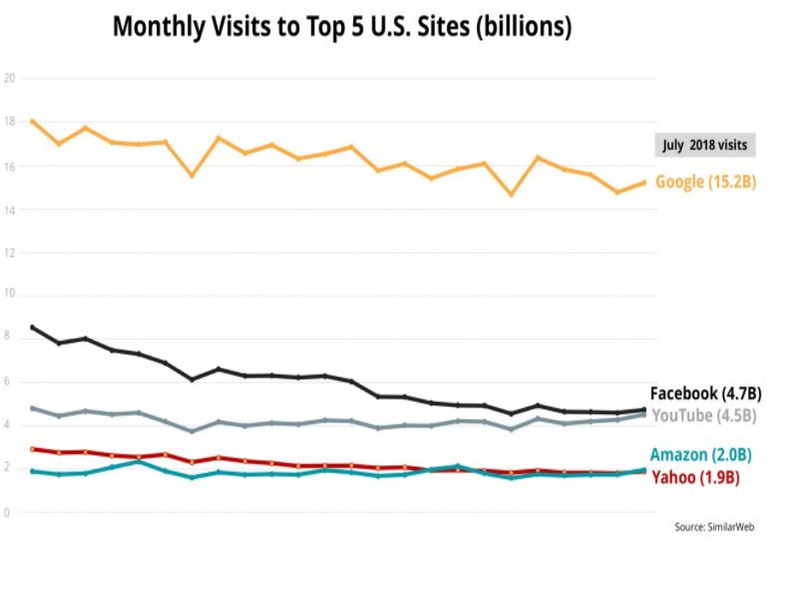 Google remains comfortably the biggest website in the US, with 15.2 billion monthly visits. 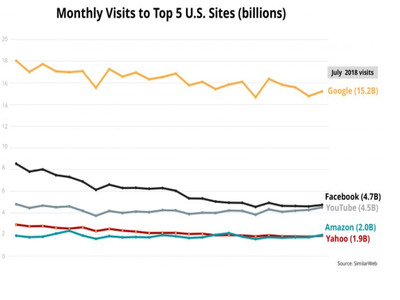 There’s no danger of Facebook or YouTube knocking the search engine off its lofty perch anytime soon. But another interesting trend SimilarWeb spotted was Amazon creeping ahead of Yahoo, in large part down to the success of Prime Day. “If current trends continue, Amazon will soon begin generating more traffic than Yahoo on a regular basis,” the market-research company added.